February’s prints feature a Ball Dress and a Walking Dress. 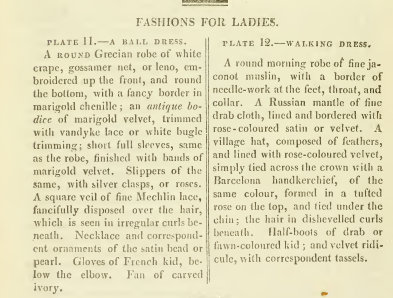 Unfortunately, there seems to be some discoloration in Plate 11, the Ball Dress. 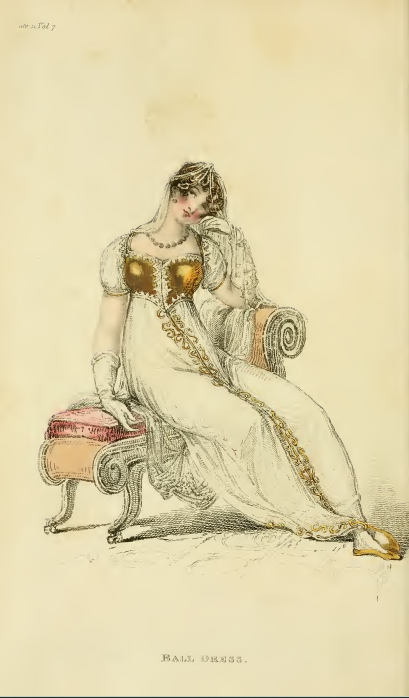 The dress’s fancy border, sleeve bands, bodice, and the accompanying slippers are all described as “marigold” in color, but the bodice in the print looks as if the summery yellow has partially faded to a brown tone more suited to autumn. Or does the print appear this way in other libraries’ copies? 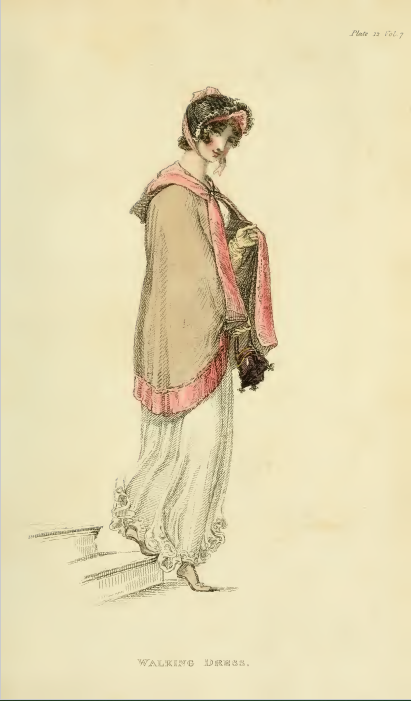 The walking costume (plate 12) also features brown, but in this case the brown seems original to the print: the “Russian mantle” is described as being made of “fine drab cloth.” The fetching bonnet, a “village hat,” is described as being “simply tied across the crown with a Barcelona handkerchief,” an accessory with which I was not familiar. 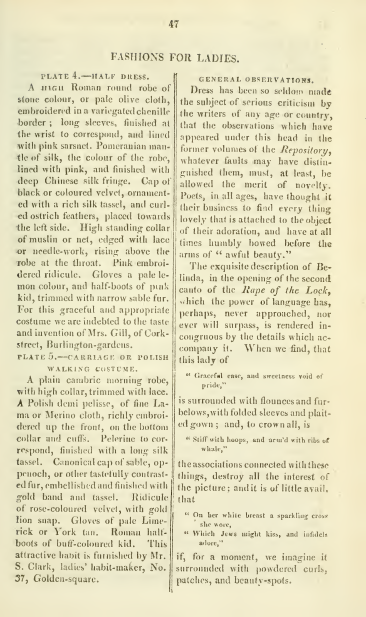 According to Fairchild’s Dictionary of Textiles, a Barcelona handkerchief is “a fine, twilled silk square in solid colors, checks, and fancy designs, worn around the head or neck. Originally made in Spain and later manufactured in Great Britain for export to southern Europe, North Africa, and South America” (41). I quite admire its shade of rose, don’t you? 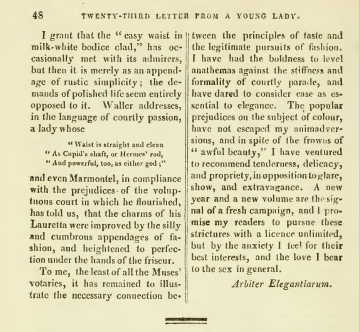 This month’s fabric sample descriptions suggest one way a Regency-era lady of fashion might while away a dull morning: by visiting a fabric warehouse. 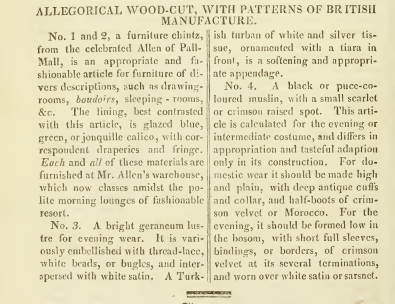 In particular, that belonging to the “celebrated Allen of Pall-Mall,” which “now classes amidst the polite morning lounges of fashionable resort.” Didn’t realize this, but according to the OED, “lounge” can refer not only to “a kind of sofa or easy chair on which one can life at full length,” but also to “a place for lounging” or to “a pastime.” Which usage do you think is meant here? 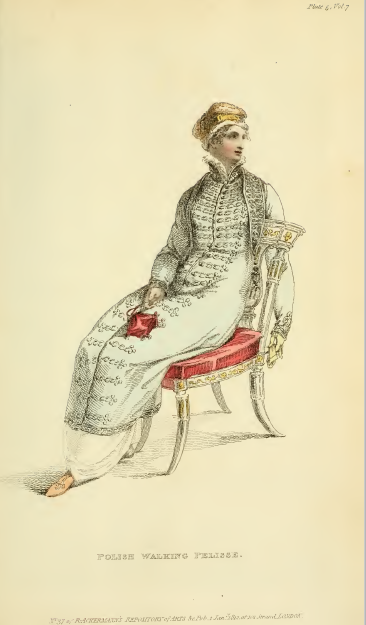 Ackermann’s fashion models are dressed for the cold in January 1812’s plates. The outfits worn both consist of multiple layers. 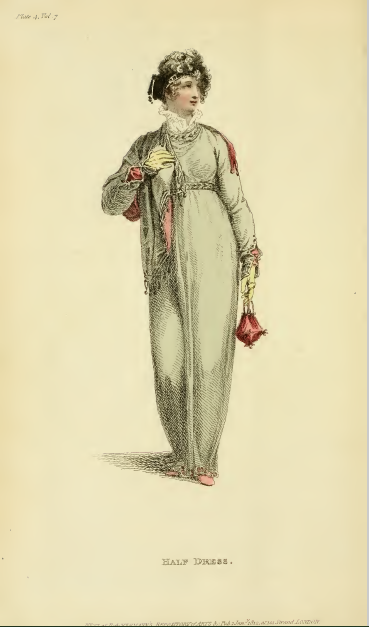 For the lady in Plate 4 (“Half Dress”), both a “High Roman round robe,” a “Pomeranian mantle of silk,” and a “high standing collar of muslin or net” ; for the one in Plate 5 (“Carriage or Polish Walking costume”), a morning robe, a demi pelisse, and a pelerine. Both also rely on fur for warmth: sable fir trim on the half boots in Plate 4; “sable, oppennoch, or other tastefully contrasted fur” for the “Canonical cap” in Plate 5. Perhaps the editors suspected the spring and summer would be particularly cold? (See Pascal Bonenfant’s informative web site on “British Weather from 1700 to 1849” for more details). This month’s fabric samples include the longest write-up of a single company I’ve yet to see in the magazine. 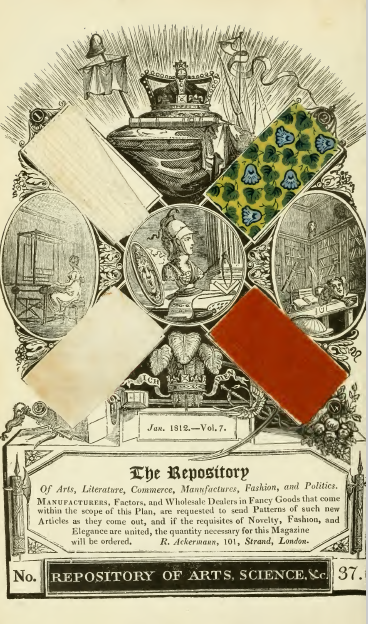 Praise for the “house of Millard, in Cheapside” goes on for more than an entire column; was it the largest, or most prestigious, fabric shop of the period? 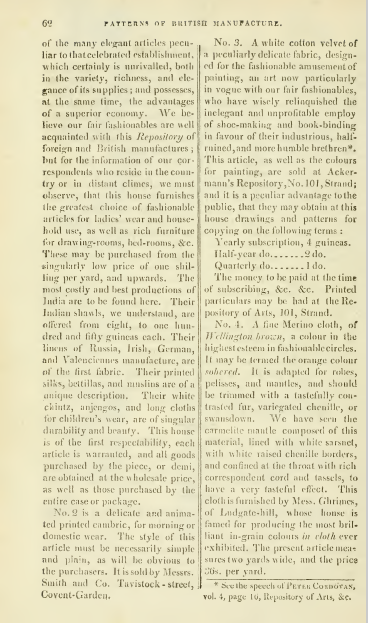 The copy claims it is “unrivaled, both in the variety, richness, and elegance of its supplies; and possesses, at the same time, the advantages of a superior economy.” While some of Millard’s goods can be had for as low as a single shilling per yard, its Indian shawls can cost up to one hundred and fifty guineas! 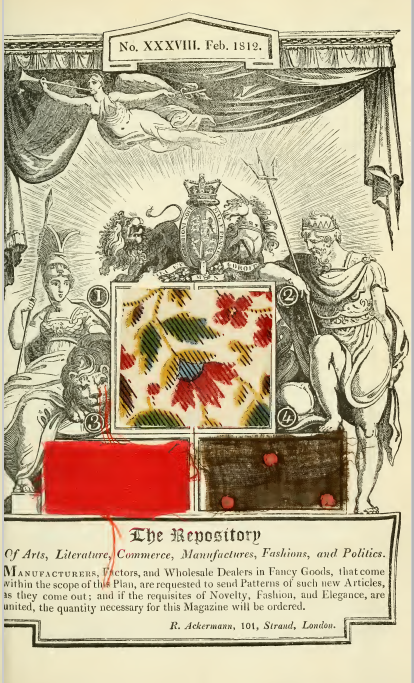 Ackermann’s also seems prescient in featuring a “fine Merino wool of Wellington brown” amongst this month’s samples—did someone have the inside scoop that General Wellington would be raised from an earl to a marquess the following month?